We have them all. You can get fresh Pork Belly here. Please call in advance. Most of our bellies are made into bacon, so we need to know you want us to hold one for you. 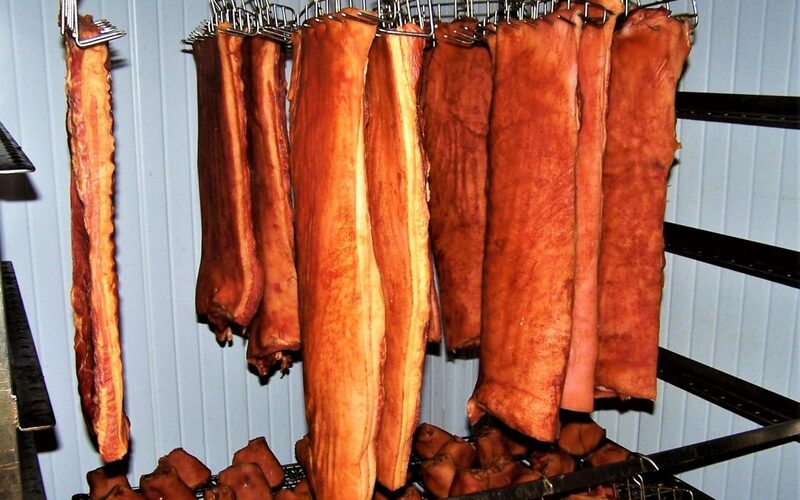 We have Smoked Bacon that we smoke in our Smokehouse to an internal temperature of 144 degree’s Fahrenheit. This is relevant because our bacon tends not to shrink like other bacon on the market. The regulation is to a minimum temperature of 130 degrees Fahrenheit. This means more moisture left in their product giving them more weight. Also once cooked you tend to have bacon that has shrunk up. Special till July 31st 3 lb. Pack for $12.00. We are playing with an Uncured Smoked Bacon and have a limited supply available. It is called uncured bacon because it doesn’t have sodium nitrite or phosphates as an ingredient. Sodium Nitrite is an artificial nitrate that has been used to preserve meats and is associated with the pink color it gives to meat. Instead, of sodium nitrite we use celery powder which has an abundance of natural occurring nitrates in it. So depending on your taste in pork bellies, come and give us a try. Grill it up for summer!